To avoid being stung by a scorpion, don't walk around barefoot where scorpions are known to live, especially at night. Inspect shoes and clothing before putting them on, especially if they have been on the floor or the ground. Keeping work boots or gardening gloves in sealed bins will deter pests. Don't put your hands where you can't see, whether at home, in the garage, or outside. If you think you might encounter scorpions, spiders, or other pests, wear work gloves. Close or caulk door openings, screen openings, and window crack so scorpions can't get into the house. Eliminate outdoor places where scorpions can hide, such as trash piles, rock piles, decaying wood, or piles of junk. 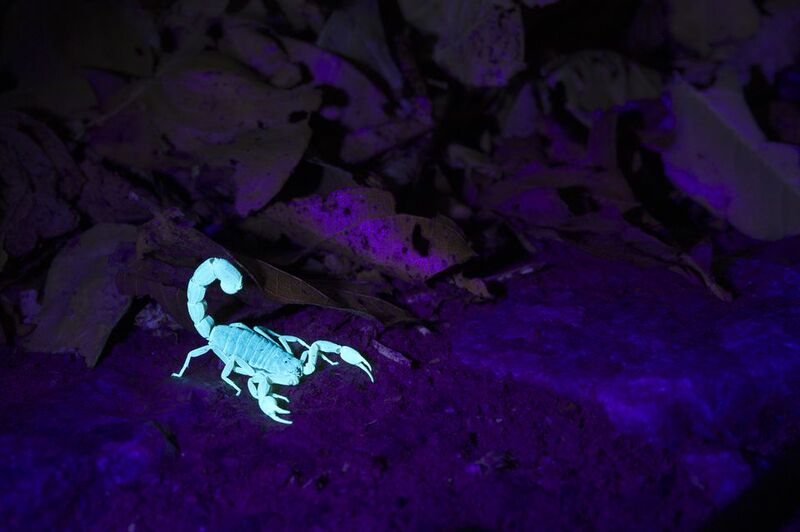 A professional pest control company can do a "blacklight" inspection to determine if there is a scorpion infestation ​since scorpions glow. Scorpions "glow in the dark," or at least they fluoresce with neon shades of yellow, green, and blue when exposed to a black light. Taking black lights into the desert at night to look for scorpions has become a popular pastime in Utah's desert country. One of the most popular places for this activity is Sand Hollow State Park near Hurricane, Utah. Scorpion stings showing signs of anaphylactic shocks, such as hives, wheezing, dizziness, chest pain or shortness of breath, will need emergency medical care. Bark scorpion stings can cause muscle spasms, random movements, and tremors of the neck or eyes, restlessness, anxiety, agitation, and sweating, especially in kids. There is often severe pain at the site of a bark scorpion sting but rarely swelling. Call 911 for suspected bark scorpion stings or anaphylactic reactions. If 911 is not available, take the victim to the emergency department as quickly as possible. If the scorpion is still at the scene of the crime, either trap it under an inverted jar (slide a piece of paper under the jar and flip the whole thing over to catch the scorpion) or pick it up using 8-inch or longer tongs.